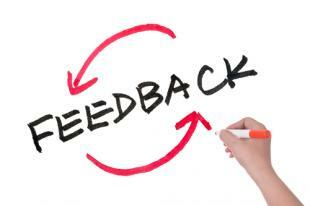 Feedback is a response to someone’s behavior or work that can be formal or informal. It can come from an employee review or the need to address an issue. Positive feedback is always welcomed, but often times negative feedback is incredibly difficult for both the person who has to give it and the one who has to accept it. Unfortunately giving and receiving feedback is an integral part of being coachable and a team player. As an employee, friend, or supervisor, it’s important to master the ability to effectively give and gracefully receive feedback. Most people say they want to be evaluated and they’re open to criticism, but it’s still hard to hear negative reviews of our work. While most of us do all we can to avoid it, constructive criticism is part of life, and you will often be on the receiving end of it. As a leader in the business world, you will also be expected to share this feedback with others. It’s easy to take offense to the opinions of others, even if they have good intentions, and it’s hard to convey difficult opinions without causing hurt feelings. Let’s look at the keys to communicating and receiving tough feedback. If you know feedback is going to be hard to hear don’t deliver it in a public place. No matter the topic, this conversation is private. Negative criticism is rarely appreciated and an audience only makes it more difficult and awkward for the person receiving the feedback. It is also important to be emotionally sensitive. If an employee is angry they are unlikely to be as receptive to feedback or willing to have a tough conversation. You’ll benefit from waiting until they’ve calmed down. Choosing the right time and location to provide difficult feedback sets the tone for the conversation; this kind of feedback can be either confrontational or educational depending on how you share it. Instead of telling an employee they’ve heard complaints about their project, their presentation wasn’t up to par, or they aren’t meeting expectations, figure out exactly what they need to work on. Specifics are important. When did the problem behavior take place, what was the task, how did it impact others, how did it impact their work, what can they do about it? Providing a blanket statement like “you aren’t meeting expectations” doesn’t help anybody. The more specific you are, the more you can help them improve on behavior, instead of simply guilting them for any shortcomings. When someone is offering you feedback, they rarely intend to attack you. It is much more likely that they’ve seen something that needs addressing. Instead of reacting in anger, take a moment to remind yourself not to take the criticism personally. While you’re listening it helps to convey a lack of defensiveness in your tone and body language, if you’re tense they’ll tense up too. Once the conversation gets defensive, it is a lot less likely to be productive. Evaluate the feedback and attempt to understand it. Instead of jumping to hurt feelings, try to see this as an opportunity to learn and improve. Practice active listening and ask clarifying questions. If you are receiving negative feedback it is important that you have examples of problem behavior. Remember, this is an opportunity to learn. The more feedback you get, positive and negative, the more you learn from your mistakes, a quality that is incredibly valuable in an employee. To learn more about giving and receiving feedback browse OpenSesame’s extensive selection of courses on the subject.